Google has just rolled out a comprehensive update to it’s local ranking algorithm that has completely changed the face of it’s local search results. The changes have left many local businesses reeling, with many sites dropping out from the 1st page of Google for their target keywords. The traditional ‘7 pack’ of local map results is gone, replaced by a new ‘3 pack’ results that do not contain any business phone numbers or address details. Google has put another step between the users being able to contact local businesses from their search results for free. If you’re not in the top 3…then your business is toast and you WILL NOT be getting seen for any local terms. ….or now in the case for all local businesses now, “If you aint top 3, you’re last”. Phone numbers, address information and the link to your Google+ page are NO LONGER displayed in the local search results. This is what it used to look like in the local search results. No more free business information listed on Google. This will have a significant impact on how users interact with local results and puts an even larger emphasis on being in the top 3 in the local results. 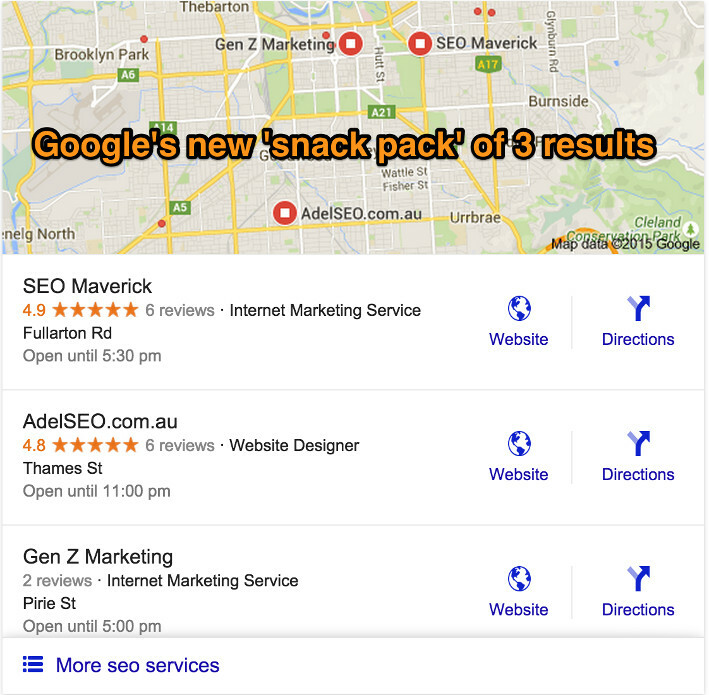 The new 3 pack encourages the user to click through to more local results. This isn’t great for the average user as it requires another click to see this information and further positioning Google as ‘the middle man’ between the users and local business. It seems like Google will be forcing all local businesses to ‘pay to play’ in their local market and may even start charging businesses for phone calls made from their search results in the near future. Google – by keeping users on Google’s products for longer, they further increase ad views. More ad views = more $$$. 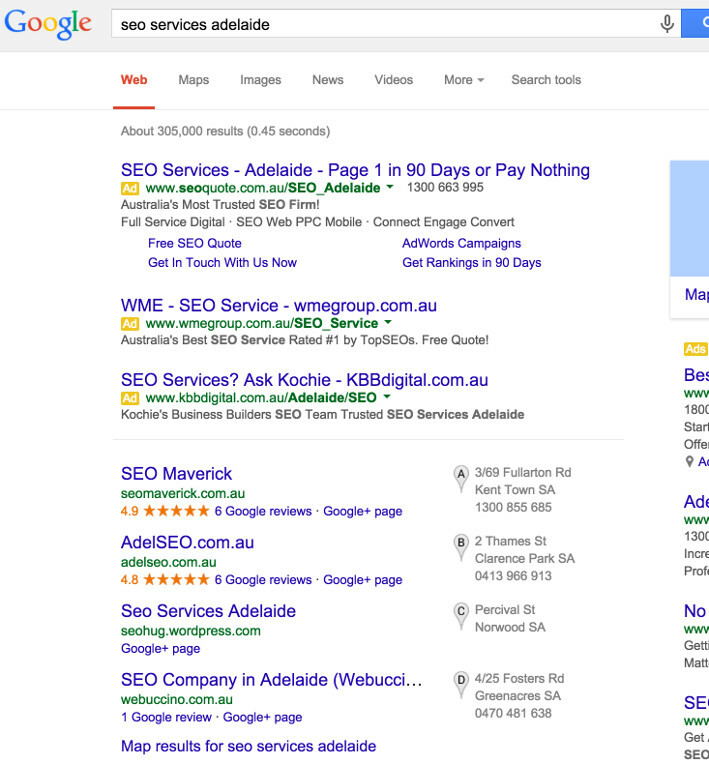 Google Adwords – more people will be forced to use Adwords to get visibility in their local area. Businesses in the top 3 – if you’re in the top 3, then you would be very happy. Bigger businesses with larger budgets – if you have a budget for Adwords, you can continue to refine your Adwords campaigns as we move towards a ‘pay to play’ model – no more free clicks for local businesses. The value of links – if you have a strong organic link profile, it’s even easier to rank as you no longer need to compete with the 7 pack of results pushing you further down the page. The average user – it becomes harder to find business information (one more click away). Local businesses who used to be in the top 7 – too bad guys, you’re gonnnnne. Most small business – it’s now even harder to rank in the top 3, and if you want some visibility, it’s time to set up your local Adwords campaign. This means that if you’re not in the top 3, then you better start working on your local SEO game. I believe the update will now place an even higher emphasis on getting reviews and building out your citation profile. But, it will be interesting to see how this plays out – it doesn’t seem like an upgrade for searchers/users and more an improvement for Google’s bottom line as more businesses will be forced onto the Adwords platform, and more ad views as the products. The local results are heading towards a ‘pay to play’ model where Google will look to charge for these local listings and only display ‘qualified’ professionals in that area. 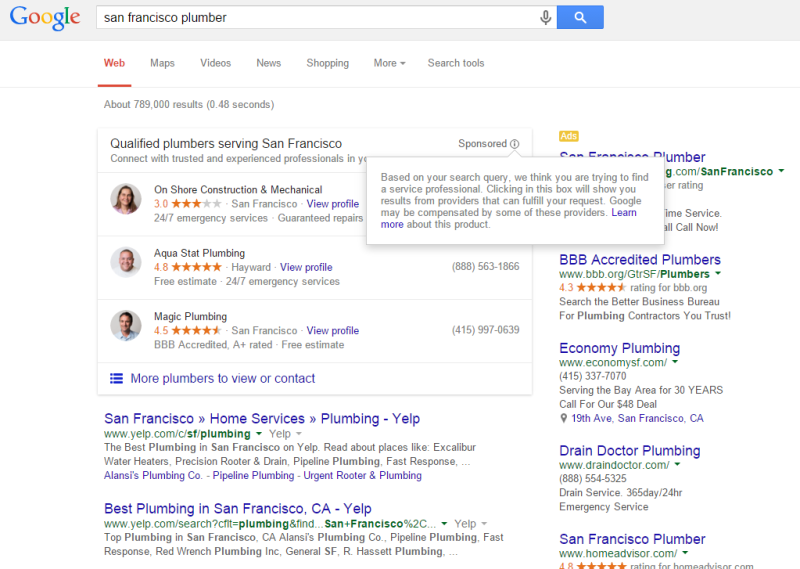 This great post outlines more about the Google Home Services ads and also encouraging businesses to become ‘certified’. This Google local update is massive and has huge implications for most local businesses who rely on their local visibility in Google to generate more business. Whilst the upgrade probably isn’t the best for users, it is Google’s platform, and they can do what they like and are attempting to monetise the local channel which has been providing ‘free’ traffic to local businesses for a long time. For small businesses, the stakes have been raised and you better be in that top 3 otherwise you’re not going to get any visibility or traffic at all. It will be interesting to see how this all plays out in the coming months. I think we’re in for a rocky ride still to come! Andrew Webber is the Company Director of The Marketing Department. He's also an avid basketballer with a passion for SEO and all forms of digital marketing! At DelMain Analytics, we’ve been reading a TON of articles about the new Snack Pack, trying to figure out the consensus of the experts. We found your article and really loved it! Would love to hear more of your thoughts on the Snack Pack as well as who your favorite basketball team is– we root for the Trailblazers! Drop me an email, [email protected] if you’d like to connect. Nice article Andrew. In most cases, I would have said that Google has upper ground, that the company is able to make any decision because ultimately, it is their product. Also, the way I see it, in most cases Google works in order to improve its algorithm thus improving user’s experience. In this case, I feel that it is a one way street from which only the big guys can profit. Luckily for us, we have an internet business so we are not as hurt. However, you have to feel for small business owners. They are having rough time last 30 to 40 years. This certainly doesn’t improve their position.